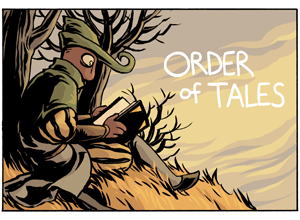 Order of Tales is an adventure story that follows Teller Koark, the last member of a society of storytellers, as he becomies involved in a complex plot dealing with secrets lost in the history of Overside. It is set in the third century of the Red Age. It was started in July 2008, and was finished in July 2010.